UK angler Kevin from Powys in Wales continued his Thailand fishing holiday stingray fishing at the Maeklong River for the second day. After previously landing a big Giant freshwater stingray of over 200kg’s and also losing possibly a bigger fish the angler was optimistic of success. It wasn’t long before Kevin was bent into the first stingray of the day in the shape of a small male of an estimated 45kg. After releasing the stingray back into the Maeklong River the angler was soon back in position in readiness for more stingray fishing action. The next Giant freshwater stingray to pick up a bait was considerably larger and was landed after a 35 minute battle. The stingray on this occasion had a width of 1.9m’s and was estimated to weigh possibly 200kg. After a short break Kevin hooked yet another monster Giant freshwater stingray which once again took over forty minutes to land. 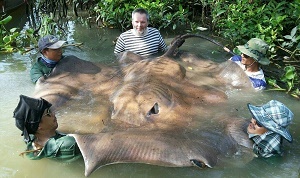 The Giant freshwater stingray was measured at a width of 2.06m’s and was estimated to weigh 220-230kg.